Sascha Bondarenko is Bike Chaser’s newest resident blogger and certainly someone with an interesting story to tell. 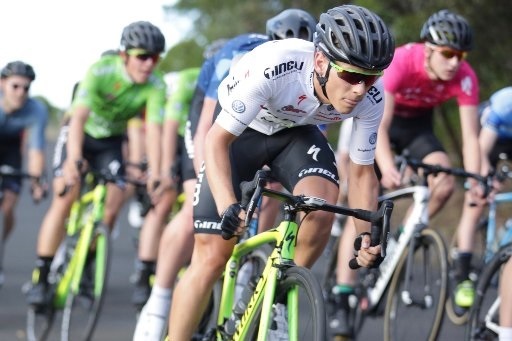 Having spent his teenage years and early twenties representing Australia in triathlons across the globe, he is now pursuing a full-time career in cycling. Sascha will be sharing his knowledge of sports science and performance psychology on a regular basis, so best you get to know him. My name is Sascha Bondarenko. I am a 23 year old cyclist who is currently riding for InForm Tineli in Melbourne. Sport was all I ever thought about and wanted to do from a very young age. As a young kid I grew up dreaming of one day being an Olympian. I didn’t care what sport I would compete in, and as such I took part in almost all sports available to me. Some of those sports included cricket, AFL, soccer, tennis, basketball, Little Athletics and cross-country running. My life was consumed by sport to the point I was doing a different sport every single day of the week including the weekends. My family had a beach house on Phillip Island, so I used to spend a lot of time at the beach. One weekend, when I was 14, my parents wouldn’t allow me to go out into the big surf unless I had my older brother with me. Being the competitive individual that I am, I instantly decided I was going to join my brother’s swim squad to prove my competence in swimming. This instigated my transition into a competitive individual sport. Of course, being your typical young country boy who grew up skating and being around my footy mates, I turned up to my first swim session in board-shorts as I was never going to be seen in speedos. Fast-forward a couple of years and I was sponsored by Funky-Trunks and sporting rainbow-coloured togs. Three months after my first swim session I was promoted to the State Squad and competing against my older brother in races. Within seven to eight months of swimming in a squad I was beating my brother, hitting state times and swimming around eight sessions per week with an additional two to three gym sessions for good measure. I still remember coming home and telling my mum I was addicted to this elite environment. I was no longer interested in fish and chips before footy training; all I wanted to do was train harder, longer and faster! I swam for around one year before my swim coach suggested I may be better suited to triathlon due to my significant lack of height and slight build. This was the beginning of the next seven years of my life where I went from racing my first Triathlon at the start of the 2009 season, to racing in the Elite ITU Junior circuit in Australia and New Zealand later that year. 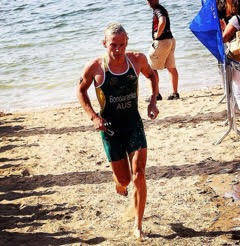 As I continued to compete, triathlon consumed my life. The hard work was invigorating and became more and more addictive. I would wake at 4 am five days a week and drive an hour to training in the city where I would do a 2-hour session, shower and jump back in the car for another hour drive back to school. Once school finished, I’d jump back in the car and drive the hour into the city for another session which would usually finish at around 8 pm. Most nights I’d eat my dinner on the way home before falling asleep and repeating the cycle the following day. I was training between one and five hours a day through my schooling life and travelling to and from the city often twice per day for training at the Victorian Institute of Sport (VIS). Before I got my own license, my brother would wake at 4 am to drive me to swim squad in the city before school, where he’d sleep in the car while I trained. Once training was complete he’d then drive me an hour to school only to repeat the process again in the afternoon. You can imagine that my family was well and truly relieved once I got my license and I began driving the 800+ kilometres per week myself. Although it was a tough lifestyle, it certainly had its perks! Triathlon took me around the world racing in the South Pacific, Asia, Europe, America and Canada where I raced at the Elite U23 World Duathlon Championships in 2013 and placed 7th. The following year I then went on to win the Australian Elite U23 Duathlon Championships in Adelaide, which also qualified me to race the World Championships again the following year. In 2014, an opportunity arose with a new coach and squad in Brisbane. My girlfriend and I relocated our studies and moved up to Queensland. 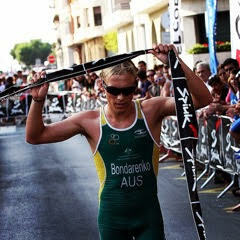 For the following two years I spent four months each year training and racing in Europe. It was an incredible experience. We were based in Vitoria, Spain, and every two weeks or so we would travel around Europe for racing. I even sat some of my exams while overseas which allowed me to continue my degree. Unfortunately however, all of those early mornings, long training sessions and late nights soon caught up with me. Towards the end of 2015, whilst racing in Europe, I was diagnosed with Chronic Overtraining Syndrome, which forced me to move back to Melbourne to be with my family. I had 12 months off which allowed me to recuperate and reassess my goals and ambitions. It also gave me the opportunity to assess and reflect on what mistakes my coaches and I had made along the way. Then began the arduous process of testing and re-testing my body in order to determine what was causing me to be so critically overtrained and fatigued. After many difficult months of rest and work with my doctors, Dr. Ian Gillam and Dr. Peter Fuller, I began to make an amazingly prompt and promising recovery. Finally, after seven months of not even being able to go for a light walk, I was back on my bike. I began with 30-minute spins which certainly enlightened me as to why so many people struggle to exercise! After all, exercise is all about consistency, and seven months on the couch between sessions isn’t very consistent. Once I was able to exercise again I decided to make the move over to cycling, which had always been my strongest leg in triathlon. I started out pursuing small short-term goals with the idea still in the back of my head that I would one day represent Australia at the Olympic Games. Before I knew it, the 30-minute spins two to three times per week became an hour, and soon I was back training 15+ hours per week. I am now officially no longer a triathlete and am pursuing cycling full time where I currently ride for InForm Tineli. In 6 months, I have come from questioning whether I would be able to compete again at an elite level, to bouncing back on my feet and feeling that I can strive for that goal once again. Over the past seven years as an athlete travelling the world, I have definitely experienced both the highs and lows of elite sport. During this time I have had to learn many, often simple, yet difficult lessons along the way. I have always had a tendency to constantly self-reflect and better myself in anyway that I can. This has led me to expand on my experience-based knowledge and pursue a Double Degree in Exercise Science and Business Administration. I love to share my experiences and what I have learnt with those around me. This has created a passion for coaching which I now get to fulfil through my business ‘The Endurance Engine’ where I offer individual online and face-to-face coaching. My decision to start blogging is quite simple. I hope to provide some insight into the life and mind of an elite athlete whilst also providing some helpful tips on what I would have loved to have known on my journey as an athlete. I’m glad you enjoyed the read. Good to hear you still enjoy being out on the bike! My website is currently offline so if you would like to shoot me an email at sascha_james@hotmail.com I’d be happy to provide you with more specific coaching details. Very well written Sascha and your story will certainly be of great value to aspiring young athletes. Hi Sascha , It was interesting to read your journey in your blog. It was very rewarding to be part of your recovery and your story and I look forward to seeing how far you go in your cycling career in the next few years. Good luck. Sasha, you have a russian sounding name, Were you born in Australia or Russia? Very good pick up. My Mum is Russian but I was born in Australia.